It’s pretty much impossible to imagine what the last 50 years of guitar music would have sounded like without the untouchable and indelible influence of David Crosby. Through his inspired and forward-thinking contributions to The Byrds between 1964 and 1967, his string of beautiful solo albums and his legendary work with Crosby, Stills and Nash (CSN) and Crosby, Stills, Nash and Young (CSNY), there’s little doubt that Crosby helped change the face of 20th century music forever. While his exquisite writing and role in helping craft majestic three-part harmonies have always been celebrated, Croz’s playing has arguably been overshadowed by the six-string heroics of his CSNY bandmates Stephen Stills and Neil Young. On Crosby’s fifth solo record, Lighthouse - released back in October - he once again illustrates what makes him such a joyous player. Delicate jazz- and folk-inflected picking, hook-laden melodies and alternate tunings all come to the fore across the album’s nine songs, resulting in what can only be described as a contemporary acoustic guitar masterpiece. Lighthouse is actually a collaborative project, co-written and produced by Michael League of experimental instrumental collective Snarky Puppy. For David Crosby, this match-up proved to be a truly creative and inspiring experience. “I thought it was sort of like hiring a master carpenter with a huge toolbox because there’s this gigantic band full of great players… but the truth is, he said he didn’t really want to do that kind of record. What he was in love with was my first solo album [If I Could Only Remember My Name, 1971] and he wanted to go more in that direction with more acoustic guitars and vocal stacks. So how did Crosby and League approach the song-writing process? “There’s really no set way that it happened,” replies Croz. “He and I both write music and he and I both write words and so it was a very organic process. We sort of decided what kind of song we wanted to write and what we were trying to say and then we went for it but it happened in every possible which way. The recording sessions for Lighthouse proved just as fruitful and rapid as the writing. “I said to Michael, ‘I want at least a month - I want to block book a month,’” David explains. “But he said, ‘No, we don’t need a month!’ I said, ‘I’ve never made a record in less than two months so you’ve got to give me a month!’ So, anyway, we went into Jackson Browne’s Groove Masters studio [in Santa Monica, California] and we cut the whole thing in 12 days and we then mixed it in New York in four days. So, he was totally right and I was totally wrong. Guitar-wise, Crosby played a variety of beautiful instruments on the Lighthouse album while Michael League also played some six-string in addition to laying down any bass lines and helping out with vocal harmonies. “I used several guitars,” says Croz. “I used one of my D-45 Martins from 1969 and I used one of my McAlisters. You know, I’ve always been a Martin guy. I love Martin dreadnoughts, particularly the older ones but all of them, really. I just love them and those are what I played for many, many, many years. But, recently - about 10 years ago - a guy called Roy McAlister found me. He’s up in Seattle and he used to work for Santa Cruz Guitars. I have five of his guitars now and he’s probably my favourite guitar maker in the world. He just has talent and they’re just stunning-sounding guitars. What tunings did Crosby utilise? “I used several,” he explains. 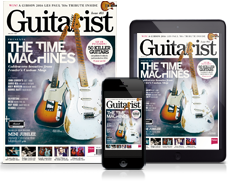 “I’ve just absorbed a crazy bunch of tunings over the years. I really love them. I used the one that I did Déjà Vu and Guinnevere in - EBDGAD - and about three or four others but I’d have to go back and look and see what they are. As a kid, David Crosby was taught to play guitar by his older brother Ethan, who also gifted David his old instruments whenever he managed to source himself a new one. As far as inspirational and influential guitarists, musicians and writers go, Croz feels there are many who are worthy of a mention. “James Taylor is such a brilliant musician and Joni Mitchell is probably the best of all of us,” says Crosby. “She is probably the best singer-songwriter of our time. I don’t think there’s anybody close. Bob [Dylan]’s as good or, if not, a better poet but she sings rings around him so I think she’s won. She’s a tremendous influence on me… as were The Beatles. And Michael Hedges. Earlier, a lot of people were a big influence - Odetta, Josh White, Pete Seeger and The Weavers. A ton of stuff. In 1964, Crosby co-founded The Byrds, for whom he played rhythm guitar, sang and wrote or co-wrote many of their best-loved tracks. including proto-psychedelic anthem Eight Miles High. It was during his three-year stint with the highly influential folk-rock outfit that Crosby first started playing Gretsches. “I started out in The Byrds playing the converted Martin D-18,” explains Crosby. “I’d converted it into a 12-string. That had been my main guitar up until then and was my main guitar in The Byrds until we made enough money for me to buy a guitar like George Harrison because we wanted to be The Beatles… so then I got a Gretsch Tennessean and I used that for a long time and then I got a Gretsch Country Gentleman, which I liked better. At the end of 1967, Crosby was fired by his Byrds bandmates following a series of disagreements and it wasn’t long before he bumped into Stephen Stills, whose own band, Buffalo Springfield, had also just split up. Soon, the pair began jamming. They then met Graham Nash of The Hollies and the trio bonded instantly over musical direction and intuitive vocal harmony. Fate had played its trump card and CSN was born. In 1969, the band released their incredible self-titled debut album and it soared to number eight on the Billboard 200 chart. Neil Young would join the line-up later that year. Before we let Mr Crosby go, we just want to ask him about another forthcoming solo record we’ve been hearing rumours about. Like 2014’s Croz album, this next record is apparently set to be another collaboration with James Raymond, David Crosby’s son. “That’s right, we’re working on it at the moment,” David enthuses. “I think it’s going to be called Skytrail and it’s going to come out in 2017. Where Lighthouse is an acoustic record pretty much, Skytrail is with a full band. David Crosby’s latest album, Lighthouse, is available now on GroundUP Music.